The 2018 heatwave will have long-term consequences for crops and livestock nutrition with farmers having to reach into winter reserves of food and forage, the Royal Agricultural University (RAU) has said. Dr Nicola Cannon, principal lecturer in agronomy at the RAU, said: “The extreme heat and very dry conditions are affecting agriculture in many ways and the impact of this extreme weather is going to be felt for months to come. She added: “Many farmers with livestock on their farm are really struggling as there is insufficient grass and forage currently growing to meet their nutritional requirements. “This has serious implications as not only is it an extra job to feed livestock now but also they are currently eating the food that was being preserved for winter feeding. This is creating uncertainty about what livestock will eat later in the year. Whilst cracked soils look very dramatic and dry, Dr Cannon said there are some advantages to this process. 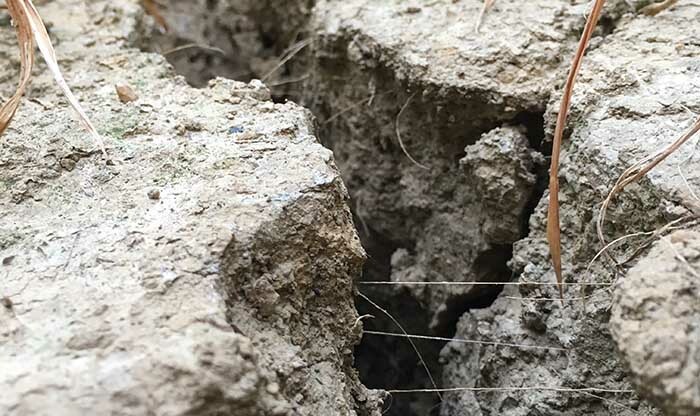 The natural cracking can help break up compacted soils thereby increasing water infiltration and drainage in the winter as natural channels exist in the soils.